Hi. My name is Peter, and I'm a workaholic. The Story of Peter E.
It wasn't always this way. When I used to do the corporate thing, I actually worked far less than I do now. Oh, sure, when I started out in the land of suits and budget cuts, I'd show up early and stay late -- all in the hopes of creeping up the corporate ladder. But I soon figured out that my extra effort wouldn't necessarily bring me fame and fortune. In fact, all it usually brought me was more work. And since I wasn't earning any more money for my additional labor, I eventually learned to do just the daily minimum requirement. All that changed when I began my transition to IP-hood. Like many IPs, I didn't just up and quit the corporate world, hang out a shingle, and start hauling in laundry bags full of money. It took me two or three years to make the transition -- all the while working essentially two full-time jobs: a day job that paid a guaranteed base salary and provided much-needed medical benefits to my ever-growing brood, and an off-hours gig as a business writer. How the hell did I do it? I became a workaholic, slogging through the standard eight hours a day plus an hour for lunch at my regular job, and squeezing in my writing projects whenever and wherever I could. This meant stealing away with my laptop to a local coffeehouse for the previously mentioned lunch hour, and firing up my home-office computer at about 9:00 p.m. -- routinely hitting the keyboard until 2:00 or 3:00 in the morning. Day in and day out, week after week, month after month. Whenever a friend or coworker complained about working late the night before -- until 9:00 or 9:30 -- I'd wince, since that was when my second shift had only just begun. When I left the corporate world several years ago, I was sure that I'd left those late nights behind as well. Since I was becoming my own boss, I imagined that I'd be working only one full-time schedule instead of two. Things haven't quite turned out that way. In fact, here I sit in the airport in Milan, Italy, and what am I doing? Having one last cappuccino for the road? Raiding the duty-free store for a $14 bottle of Irish whiskey that costs three times as much back in the states? Hell no. I'm writing this column on the laptop that I recently fortified with an extra battery so it wouldn't crap out on the long, transatlantic work-fests that I carefully laid out for a recent business trip to Europe. Why do workaholics get such a bad rap? Working too many hours, too many days of the week is the root of all evil. Right? That's certainly been my official party line, and it's the official party line of most every business writer you're likely to run into. You know: busy business people should be on guard against becoming workaholics, instead finding a reasonable balance between their work and their personal lives, so that work does not become an all-consuming, end-all, be-all obsession that fills every waking hour of every waking day. Just say no, and all that. But in reality, I rarely take my own advice. The truth is this: if you want to succeed as a freelancer, you have to be at least something of a workaholic. No one admits this, but it's true. You need to work hard to establish yourself, to fortify your reputation, to market your services, and to ensure that your clients are happy. The work never stops -- and because of this, you have to keep in close contact with your inner workaholic. But you know what? I say that it's worth it. As an IP, I actually have much more of a "life" than I ever did as a wage slave. I may be the original poster boy for 24/7, but since I'm the boss, I get to decide exactly when I do my work, and when I take my breaks. So, while my 9-to-5 pals are stuck in rush hour traffic on the way to work in the morning, I'm taking my daughter to school and chatting with the parents of her classmates. Or when my corporate coevals are just starting to think about jumping into their cars to begin the long commute home, I'm in the driveway riding bikes with the kids. I may end up working late into the night, but not before I've tucked the kids in their beds, and exchanged stories with my wife about our busy days. But it's not just about spending quality time with the family unit. As a workaholic, I get to see up close and personal the direct relationship between the work I do and the consequences -- namely, the cashola -- of my labor. A nice feeling, I can tell you. I believe that many other successful IPs secretly feel the way I do about workaholism. Doesn't matter what your gig is, there's almost always a direct correlation between hard work and success. I'm currently on a tour of Europe with the Orpheus Chamber Orchestra, working on a project that should see the light of day by early next year. Each of the musicians comprising the group is an IP -- juggling their Orpheus gigs with all kinds of other projects. Some play for the New York Philharmonic, the American Ballet Theater, or the New York Opera, some teach at Julliard, others do Broadway shows or commercial work, and most do some combination of these. Each of these people is at the pinnacle of the music profession. And, to a person, they all work their posteriors off. They wouldn't be nearly as successful as they are if they sat around playing pinochle half the day, enjoying some mythical "balanced" work life that we're supposed to all aspire to. Successful IPs are driven. We're compulsive about our projects. It isn't really a choice, not something that can be switched on or off. If we didn't have work to drive us, we'd find something else to obsess over, like bowling or macramé. We're just smart and lucky enough to know how to put our compulsion, quite literally, to work for us. Successful IPs fill their workbaskets with lots of different eggs. Unlike most non-IPs out there, I'm constantly on the lookout for new projects to fill my schedule. Since no single project provides enough income for me to dedicate myself solely to it, I'm performing a constant juggling act -- working on one project for a few hours here, another project for a few hours there, and yet another for a few more hours over there. Not only that, but the more jobs I take on, the less dependent I am on any one job in the event my client decides to cancel or screw me in some other way. Successful IPs push it to the limit. How will you know how much work you can really take on if you never push yourself to the limit to find out? I have pushed myself to the limit -- and beyond -- on many occasions, and I have always managed both to thrive on the experience, and to please my clients. Sure, I might have moaned and groaned about it at the time, but the challenge of producing a high-quality product under a serious deadline is what makes life interesting for me, and it reminds me that I'm alive. Am I saying that all IPs should be total workaholics? No. But I do believe that working hard gets a bad rap. If you can't imagine yourself being at least a part-time workaholic, then perhaps becoming an independent professional isn't the thing for you. Hi. 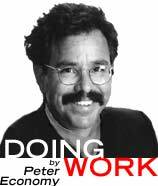 My name is Peter, I'm a workaholic, and I'm proud of it.